"No one will have any other desire in heaven than what God wills; and the desire of one will be the desire of all; and the desire of all and of each one will also be the desire of God"
Indifferent toward religion as a young man, Anselm became one of the Church's greatest theologians and leaders. He received the title "Father of Scholasticism" for his attempt to analyze and illumine the truths of faith through the aid of reason. At 15, Anselm wanted to enter a monastery, but was refused acceptance because of his father's opposition. Twelve years later, after careless disinterest in religion and years of worldly living, he finally fulfilled his desire to be a monk. He entered the monastery of Bec in Normandy, three years later was elected prior and 15 years later was unanimously chosen abbot. Considered an original and independent thinker, Anselm was admired for his patience, gentleness and teaching skill. Under his leadership, the abbey of Bec became a monastic school, influential in philosophical and theological studies. 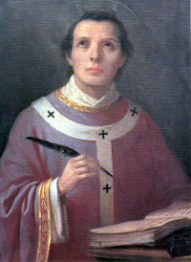 During these years, at the community's request, Anselm began publishing his theological works, comparable to those of St. Augustine (August 28). His best-known work is the book Cur Deus Homo ("Why God Became Man"). At 60, against his will, Anselm was appointed archbishop of Canterbury in 1093. His appointment was opposed at first by England's King William Rufus and later accepted. Rufus persistently refused to cooperate with efforts to reform the Church. Anselm finally went into voluntary exile until Rufus died in 1100. He was then recalled to England by Rufus's brother and successor, Henry I. Disagreeing fearlessly with Henry over the king's insistence on investing England's bishops, Anselm spent another three years in exile in Rome. His care and concern extended to the very poorest people; he opposed the slave trade. Anselm obtained from the national council at Westminster the passage of a resolution prohibiting the sale of human beings.